COTOVICUS - Varia antiquitates in itinere Bethleëmitico confpecta. . .
COTOVICUS, J. - Varia antiquitates in itinere Bethleëmitico confpecta. . .
Varia antiquitates in itinere Bethleëmitico confpecta. . . - COTOVICUS, J. 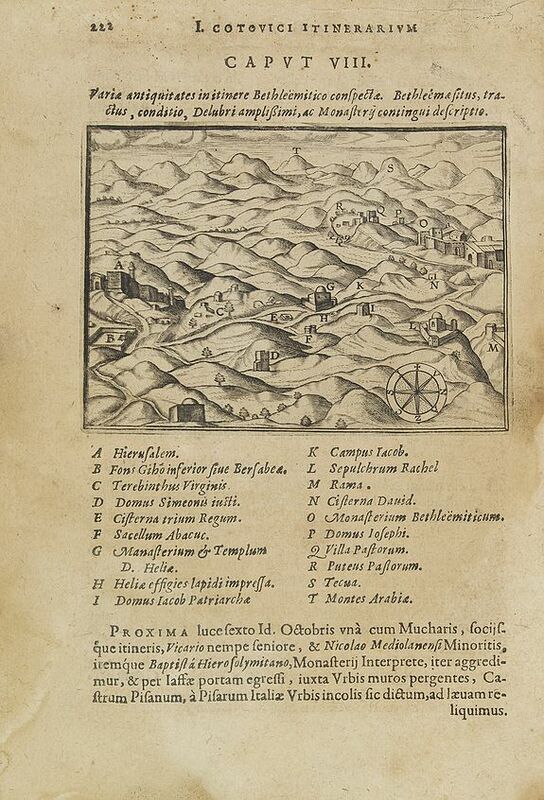 Title : Varia antiquitates in itinere Bethleëmitico confpecta. . ..
Map maker : COTOVICUS, J.. Date : Antwerp, Verdussen, 1619. Size : 3.3 x 4.7 inches. / 8.5 x 12.0 cm. Description :Text page with copper engraved illustration of region north of Jerusalem taken from Itinerarium Hierosolymitanum et Syriacum, in quo variarum Gentium Mores et Institua insularum, regionum, vrbium situs... Text illustrated with an engraving representing different sites of the Holy Land entitled : Varia antiquitates in itinere Bethleëmitico confpecta Bethleémafitus, traetus, conditio, Delubri amplifsimi, ac Monaftery contingui defcriptio. Caption : A - T.
Cotovicus (also known as Kootwyck), professor of law at the University of Utrecht, traveled 1598-99 via Corfu, Zante, Crete, Rhodos and Cyprus to the Holy Land and to Syria. The illustrations is based on those published in Zuallart''s account. Tobler p. 87. Blackmer 416. Yérasimos page 432 - 33. Weber II, 224. Graesse II, 285. Condition : Paper browned. With marginal stainings. Margins brittle.